“I’m not talkin’ ‘bout pleasure boatin’ or day sailin’. I’m talkin’ ‘bout workin’ for a livin’. 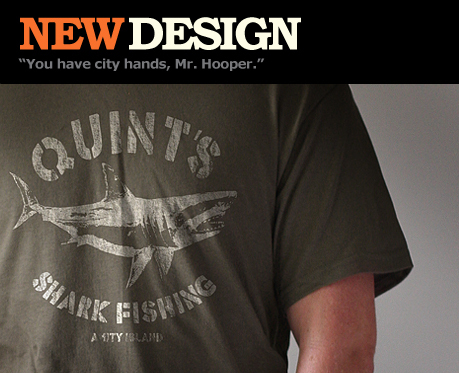 I’m talkin’ ‘bout sharkin’!” We pay homage to one of cinemas best loved characters, Quint from Jaws (1975). One colour screen print on a regular fit, 100% ultra cotton olive t-shirt.